Sadly though we cannot concentrate on Channel 4 and its fraudulent vindictiveness, which was what had originally been promised. Instead we have also my old friend Yolanda Foster, whose trajectory from young idealist to implacable Fury, Alecto perhaps, unceasing in anger, I have watched in some alarm. I do hope she will be transformed soon into a Kindly One, given what I still hope is her own better nature. Then we have Jan Jananayagam, who represents an organization that also dodged debate with me, through the person of Bruce Fein who made grandiloquent threats and then panicked. I am pleased that Jan Jananayagam has had more courage, and I have the greater sympathy for her because she is not a mercenary for hire, but I believe has deep and sincere convictions, even if these are not always justifiable. Where she does have reason, and I can understand this in youngsters of her generation, is because of the violence against Tamils of the early eighties which has scarred so many of those who suffered then. It also had a deep impact on those who were abroad at the time. And it had a deep impact on many of us who were in Sri Lanka, including myself. Though I was not in Colombo at the time, I came back to a house full of my friends who had suffered, and for decades afterwards we housed young people of Jan Janayagam’s age who had no other refuge. The first of these youngsters was from a family in Colombo that had suffered the viciousness of then Cabinet Minister Cyril Mathew, who, until he was totally outclassed by Mr Prabhakaran, did more to foster a culture of violence than anyone else, as I noted last week in Parliament. Ironically the next two were refugees from LTTE terrorism in Jaffna, and I am still trying to help them to recover their house which the LTTE used, and which has now been occupied by a Grama Niladhari. The elder of the sisters, I should note, was a relation of the Ponnambalam family, but she used to tell my old friend Kumar Ponnambalam that he would do nothing for them except make political speeches, and it was only old family friends that actually gave them a home in Colombo. This irony I believe suggests too how we should move forward to the Reconciliation and the Justice that Sri Lanka needs. We must avoid political posturing and instead work on what can and should bring us together, without denying the majoritanism on the one side and the brutal terror on the other that drove us apart. In the draft National Policy on Reconciliation that was prepared in my office, we have stressed three areas in which swift action is needed. The first and most important I feel is ensuring Recovery from the ravages of conflict, and Equitable Development. In fact much has been done to remedy the situation of displacement and dispossession that the Tamil people faced in 2009 after they had been forced to abandon their homes and act as human shields. Those of us who saw Cambodia several years after the ravages of its internal conflicts, Lebanon where hundreds of thousands of Palestinians are still suffering in camps more than half a century after they were displaced, sacrificed on the altar of European guilt, Afghanistan three years after the Taleban were removed only for the country to be neglected as the United States engaged in adventurism in Iraq – those of us who know the world realize how fortunate our displaced are. They have been resettled more quickly than elsewhere, and those areas are flourishing in a manner that was unthinkable three years ago. But though these are positive features in comparison with what goes on elsewhere, we must still strive to do more. Though the programmes implemented for infrastructural development have been fantastic, we could ensure better planning, so that the people of the North will benefit from the opportunities that have been corrected. Better and more diverse training, and better mechanisms for local consultation, are what the people requested, at the various Divisional Secretariat Reconciliation Committee meetings I have attended over the last several months, and I hope we can deliver even more in these areas. This brings me to the second area where we need progress, namely that of Political Participation and Administrative Accountability. But we must do this in terms of total empowerment, not what is termed political power which turns all too often into the power of politicians. What we need are mechanisms to empower people in every way, in particular economic and social empowerment. Only through that can we ensure that the political power vested in the people is not hijacked. In this regard we must promote decision making at lower levels, along with better mechanisms of consultation. In short, the principle of subsidiarity should be taken forward. Finally we need Justice and Truth and Understanding but these should be to ensure restitution not retribution. In the several Reconciliation meetings I have attended in the past few months at Divisional Secretariat level, this is what the people want, not what Rita Skeeter Snow and the rest go on and on about, in what seems a deliberate attempt to prevent Reconciliation. I hasten to add that, as I have said consistently over the last three years, any credible allegations of violations of Law should be investigated and punitive and remedial action taken. But we cannot be dragooned into witch hunts by sensationalism and falsehoods. I have published two books on the falsehoods that have accompanied allegations. This does not mean that all allegations are false, and indeed the Lessons Learnt and Reconciliation Commission has noted one area in which action must obviously be taken. But, as is clear from the section in ‘The Road to Reconciliation and its Enemies’ on addressing concerns, there is much manipulation of facts and figures. I will be happy to rebut any allegations in accordance with what has been written there, based on careful attention to evidence and observation of the sites concerned. After all, concern about safeguarding civilians was entrenched in our approach to the problem of eliminating terrorism and, as head of the Peace Secretariat, I would monitor Tamilnet every day and check on anything that was worrying. 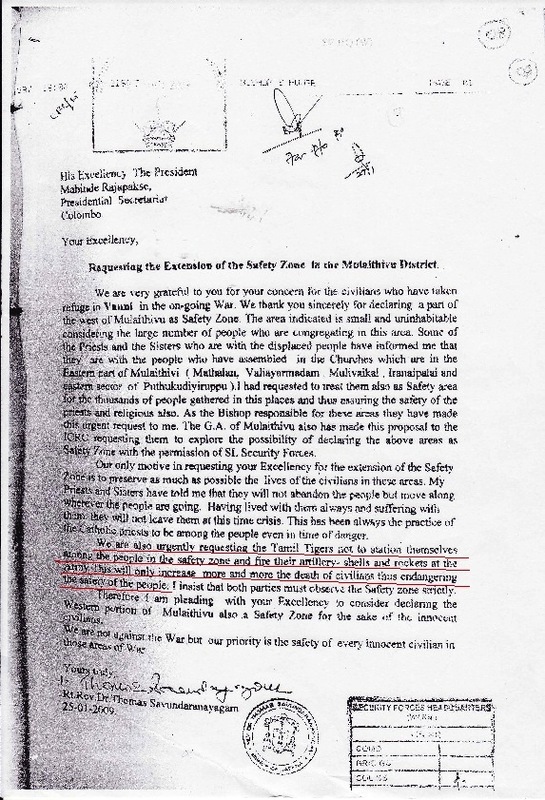 I have therefore a schedule of everything mentioned and it should be understood by everyone that, right through to the end of 2008, there were allegations on TamilNet, which I would assume is the worst possible case, of only 78 civilian deaths in the whole of the conflict. Things were worse in 2009 but on the first day on which there were high figures, the UN, which had called us early, to report allegations, later sent a text message to the effect that they believed most of the firing had come from the LTTE, which had moved weapons into the No Fire Zone – and ignored the request of the Bishop of Jaffna that they move them out again and stop endangering civilians. Given that the No Fire Zone was not accepted by the LTTE, and that they were firing from there, the Laws governing conflict clearly allow for defensive fire, providing it is proportional. The records for instance of actual shells in hospital premises, fewer than half a dozen over six weeks, indicate that the forces were well aware of the need to protect civilians while not allowing the LTTE to get away with continuing murder. 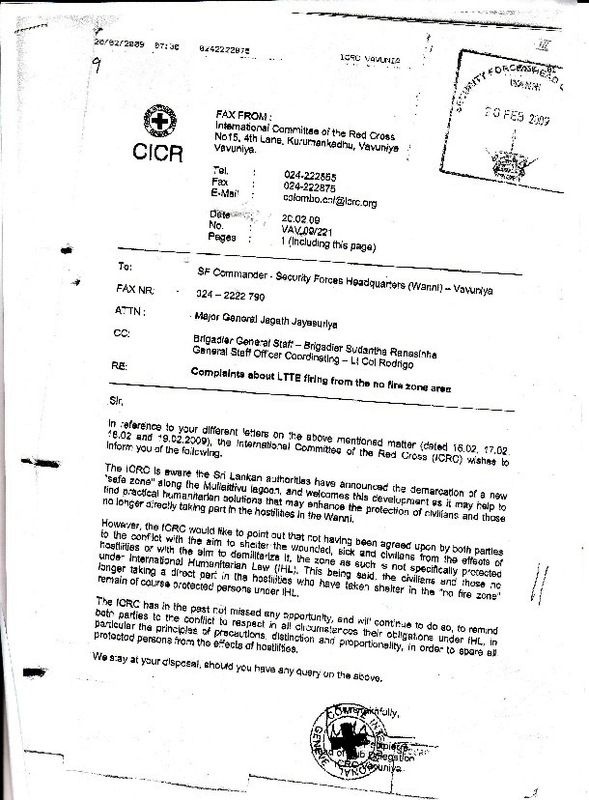 All this is documented here, with references to ICRC and UN documents, which have thus far been ignored by the sensationalists. I will therefore confine myself here to making just a few points about the Channel 4 propaganda, and the manner in which flaws in its composition are skated over. Sunanda Deshapriya, had to leave Sri Lanka after the organization for which he worked, the Centre for Policy Alternatives, which Yolanda knows well, found he had defrauded them. The video sent to the UN differed in salient particulars from that which had been supplied to Channel 4. Having noted this, the so-called experts then decided that the video was authentic, and that the problems which we had pointed out could be explained away. The false claim about the date they explained by saying the person making the film might have deliberately falsified the date to avoid detection. The moving leg of a purportedly dead person they explained away by saying – and I quote – that ‘it has not been definitively established whether this person was already deceased, or merely wounded, intoxicated, sleeping, or possibly even uninjured and feigning death after being shot at and missed in order to evade actual injury or death at the hands of a more competent marksman’. The idea of the wicked people who shot two victims through the head at close quarters having adopted a different approach which led to one of their intended victims feigning death is almost as bizarre as the ideal of someone sleeping through this whole episode, perhaps because he was drunk, lifting up his leg and then letting it collapse. After I had pointed this out, the so-called expert provided another explanation, but frankly the idea of the world accepting the theories of such experts is frightening. Even worse is the idea of a UN Special Rapporteur believing such a man, and using his services again, along with those of someone who had previously been commissioned by the Times to look into the video and who – surprise, surprise – found it credible. It should be noted however that, as far as he himself is concerned, the current UN Special Rapporteur has higher standards, inasmuch as he had told one of his students that, if he needed a defender, he would choose me. It is a pity that, when it comes to denigrating a nation, his standards are so much lower that he relies on the pronouncements of Channel 4 and a collection of arguably permanently intoxicated putative experts. Given such absurdities, it is sad that we now have a situation in which, with no hard evidence at all, several sets of allegations are shored up by reference to each other. Figures are produced out of thin air, with the Times, it may be remembered, producing three different reasons for the initial whopper of 20,000 that it asserted. The final claim, that this was based on graveyards, has been conclusively falsified by a report of the American Association for the Advancement of Science. Symptomatic of the deceit practiced by those who attack us was the manner in which Human Rights Watch and Amnesty International – yes, sadly even dear old Yolanda Foster transformed from decency into a deceitful fury – hyped up the report when they commissioned it, and then forgot all about it when its conclusions were not what they wanted. Unlike the rigid pattern of the previous two sites, the layout of this area was much less regular. In total, 44 burials were identified at this site on May 6, with no changes observed between May 6, May 10, and May 24. Contrariwise, in the supposed LTTE graveyard, ‘Visual inspection of the imagery identified the appearance of 148 probable graves at this location between April 19 and May 6’. This is what we have to put up with again and again. As I have mentioned I have some sympathy for the bitterness of the Tamils, those whose families suffered in 1981 and 1983. But the mercenaries, those who work for money or political gain, and who seem determined to prevent reconciliation, are contemptible. Channel 4 has a nasty history of connivance with abuse, as we saw during the Iraq War. This does not mean that all its employees are hypocritical or without any ideals, but the refusal to engage that they have evinced since they first began this campaign is worrying. I can only hope that in time decency will reassert itself, and you will begin to recognize the importance of truth, of solid evidence, of balance, instead of engaging in rhetoric and falsehood. For the Tamils here who are still full of the bitterness of the past, and saw the terrorism of Mr Prabhakaran as the only way to alleviate this, all I can say is, think rather of the Tamils of Sri Lanka than the animosities and the ambitions of the past. Any suggestion that government must do more for the Tamil people is acceptable, for these are our people, and if you visit you will see that government is doing its best, though subject to the usual financial and administrative constraints of government activity. Assistance towards the training and employment generation we need to advance swiftly will also be welcome. But to allow yourselves to fall into the trap set by those who live off war would be a mistake that you must not make, for the sake of all the people of Sri Lanka.